There will be No Passing! Photo Picture Classic Cars for sale & Classifieds - Buy Sell Classic Car & Classic Truck Classifieds. 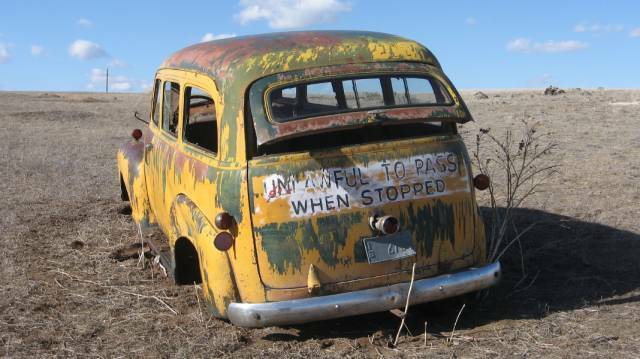 Car Photos > Rusty and Abandoned Classic Trucks > There will be No Passing! There will be No Passing! Looks like you might have to wait awhile to pass this old school bus. Strange school bus. Never seen one like it! Looks to be a 47-52 chevy/GMC made into a school bus.Looks like the common green before the yellow went on.Maybe a special needs or very small school? this is a very unusual looking school bus....can't say i've ever seen an old one like this before....very cool!